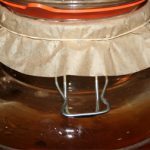 Home » Why Soak Grain? The simple step of soaking grain will neutralize harmful phytic acids and enzyme inhibitors, making it more nutritious and easier to digest. Soaking your grain can be a pain. It’s just not convenient. No matter how you look at it, ripping open a bag of flour and using it in a recipe is so much easier than waiting 8, 12 or even 24 hours for the flour to soak. The good news is, with a little preparation and routine, you can easily work this healthy traditional practice into your daily life. All grains were created for longevity. If a grain is placed on a patio and never touched, it will stay there for years, unchanged (assuming it remains protected from weather). But if that same grain is buried in damp, fertile soil, at the right temperatures, it will begin to sprout within days. Grains contain phytic acid and enzyme inhibitors. Phytic acid is an organic acid in which phosphorus is bound that blocks mineral absorption in the intestinal tract. This acid can be neutralized in as little as seven hours of soaking in water with an acidic medium (like lemon juice or apple cider vinegar). Untreated phytic acid binds with minerals (calcium, magnesium, copper, iron and zinc) blocking their absorption. Enzyme inhibitors can also be neutralized by soaking. They are present in the hulls of all seeds and add beneficial enzymes which increase the amount of nutrients present in the grain, especially B vitamins. All this goodness is locked up and unavailable to us unless we unlock them through soaking, sprouting or souring. Protected by their indigestible enzymes, grains can pass through our digestive system completely intact. Unfortunately for us, our bodies must pay a price for consuming these indigestible compounds. Gluten, lectins, enzyme inhibitors and phytic acid are what we call anti-nutrients. Basically, they steal nutrient stores as the body attempts to digest these indigestible compounds. Eating commercially produced, unsoaked grains can cause serious damage to our bodies over time. Traditional societies passed down techniques for proper grain preparation. If we look back in history, we’ll see practices of soaking, sprouting and fermenting grains prior to consumption. In India, rice and lentils were fermented for at least two days then made into idli (a soft bread) and dosas (a crepe-like pancake). In Africa corn was ground, soaked then fermented to make a sour porridge called ogi. Ethiopians made injera bread by fermenting teff for several days before baking. Not only are these traditional soaking practices lost in our Western culture, but the introduction of the USDA food pyramid (introduced as a “teaching guide” in 1992) has programmed our brains to think grains should make up the bulk of our meals. This isn’t so, and could be partly to blame for all the health issues surrounding grains today. I find it interesting that my grandparents didn’t have food allergies, and neither did their parents, or their grandparents. Factory production of grains, the pesticides used in their growth and the large quantities/frequency in which they’re eaten have wreaked havoc on our digestive tracts. 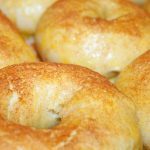 Grains have the potential to cause significant gut damage that can result in eczema, allergies, diabetes and other auto-immune diseases, especially in the young. Read more about Leaky Gut Syndrome here. I don’t share all this to scare you away from eating grains. Quite the opposite, as diets that don’t contain grains can lead to other serious health issues that can effect our endocrine system. Our family enjoys grains daily, but we choose to eat them after they have been properly prepared through soaking, sprouting, or souring (fermenting). By buying organically grown grains and following the proper preparation methods, even those who suffer from gluten intolerance (not a true gluten allergy, there’s a difference) may be able to enjoy grains again. These methods are designed to do what our body can’t by breaking down the anti-nutrients (gluten, lectin, phytic acid, etc). The hard to digest plant protein within the grain can be difficult to digest. By soaking, souring or sprouting your grains prior to eating, this protein is broken down (think, pre-digested). 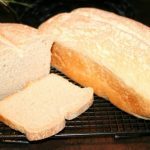 Studies in Italy show people suffering from Celiac Disease to be able to eat true sourdough bread without digestive upset or auto-immune symptoms. 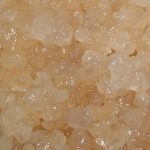 Did you know the oatmeal our grandparents used to buy recommended soaking them overnight on the label? With the invention of “quick-oats” and our fast paced life-styles, this traditional practice has long been forgotten. This quick-and-easy overnight oatmeal is packed with nutrition and will keep you going strong until lunch. Add rolled oats, 1 cup water and acidic medium into a pot with lid. Let soak overnight, at room temperature (or at least 6-8 hours). The next morning, add one cup raw milk (or water), a tablespoon of butter and proceed with cooking. Add a dash of good quality sea salt, to taste and berries or other mix-ins.